The first model was launched in 1984, and has through the years undergone an evolution that has seen it keep its name as being one of the most solid SUVs on the market. Let’s take a look at the various specifications of this fine off-road machine. 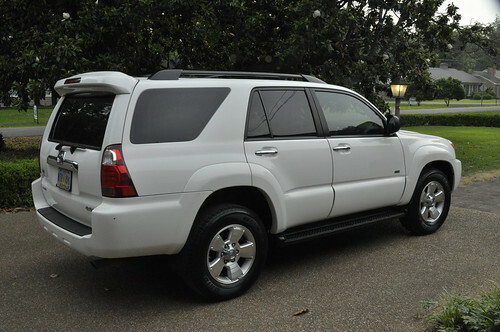 The Toyota 4Runner looks rugged and comes equipped with 17 – inch 6-spoke alloy wheels. The color-keyed front and rear bumpers with chrome door handles feature prominently adding to the sophisticated look that the car embodies. Multi-reflector halogen headlamps with an on-off feature help illuminate the road powerfully at night, avoiding unexpected turns and obstacles. Hill-start assist and hilll-descent control are especially useful for hilly terrain, and ensures the car doesn’t roll away when on an up or down gradient. A 4.0 liter v6 engine cranks out 270 horsepower, and 278 lb-ft of torque. The Runner is capable of accelerating to 60mph in 7.2 seconds, and has a towing capacity of 5000 pounds, regardless of the trim. The five-speed automatic transmission gives you that personalized feel of control during vehicle handling. Lastly, the Runner comes with a fuel efficiency of 17/23 mpg city and highway respectively. 5. Toyota Emergency Assistance, which includes stolen vehicle locator, automatic collision notification and roadside assistance. The spacious seating is adequate for five passengers, and the second-row seat center armrest with cup-holders is a clever and convenient addition that enhances comfort for passengers. The optional third-row seat means that the Runner can accommodate up to seven passengers, although the extra seating is only suitable for small children or adults. It is built on a truck body, but the handling feels smooth and integrated. The Toyota 4Runner starts at $31,090, and optional trims include Trail and Limited modes. This is one off-road vehicle that is as utilitarian and functional as it is powerful and exciting. It also features acceptable cargo capacity, which makes it great for camping and long trips. The DVD navigation system with voice activated control is one of the most technologically advanced systems that will help you take your Runner to any destination within the contiguous United States, Hawaii and numerous metropolitan areas within Canada. The light steering makes for easy parking and contributes to minimal kickback as you navigate your way through the rocky outback during one of your many adventures in this gorgeously rugged, powerful and efficient mean machine. From its impressive interior to its sporty wheel covers you just can’t go wrong with a Toyota 4 Runner.